Just when you thought the alien abduction craze was history along comes a survey, commissioned by ITV, that claims 3% of Britons say they have been space-napped. And if the findings are to be believed, the extra-terrestrials much prefer to pick up punters in Birmingham, leaving folk in Northern Ireland well alone. The phone poll for This Morning’s Paranormal Week asked 2000 people if they believed in a range of weird stuff including ghosts, angels and the obligatory aliens/UFOs. Perhaps unsurprisingly, around one third of the responses collected by OnePoll said they believed aliens existed and almost one fifth said they had visited Earth. Similar responses were obtained for questions on belief in ghosts and angels. Even more significant is that 7% of 18-24 year olds responded ‘yes’ to the abduction question. This compares with just 1% of the over-55’s. Is this because aliens are more interested in probing teenagers than their more cynical elders ? Or is it more likely that some of the younger respondents were the type of student wag who might indicate Jedi Knight as their religion on the census form? Surveys of this size might be accurate gauges of present attitudes (with +/- 2%) but they don’t require their subjects to take lie-detector tests. And the construction of the survey is very important, particularly if leading questions are asked. But there’s no way of telling which it was from the results. Nevertheless, equally intriguing was the breakdown of results by gender and region. 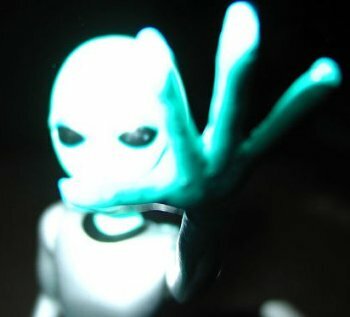 Women, it seems, are more likely to accept paranormal beliefs than men, but while women are more likely to believe in ghosts and angels they are less likely to believe in aliens and UFOs than men. On the other hand, aliens appear to love Brummies. According to the OnePoll survey, if you live in the West Midlands you are far more likely to believe aliens have visited Earth – and eight times more likely to have been abducted by them – than if you live in Belfast. This entry was posted in Uncategorized and tagged alien abduction, aliens, belief in aliens, belief in angels, belief in ghosts, fairies, IPSOS Mori, ITV, Jedi Knight, Northern Ireland, OnePoll, opinion polls, Paranormal Week, The Sun, This Morning, UFOs, West Midlands. Bookmark the permalink. As a Brummie I can offer a very rational explanation why aliens like Brum. It is because there is no atmosphere at Villa Park. One Poll? Aren’t they the guys that pay people 10 pence a survey or something? I have felt for some time that the alien visitors explanation of UFOs is just mostly a modern belief system, believers certainly don’t need much in the way of evidence or critical thinking, just as people believing in God do not. I’m pretty sure that things like demonic possession and alien abduction are similar experiences, just that the experiencer is using its belief system to explain it. Things like sleep paralysis can be pretty scary, I know lol, and i can see someone’s imagination being part of explaining it.